All Response Media’s TV Star Competition 2019 extended to Friday 1 March! What could your small business do with a fully-funded TV campaign…? All Response Media us looking for “businesses with the X Factor” to take part in its annual TV Star Competition, with a media campaign worth £50,000 up for grabs. This year partnered by Startups.co.uk and Sky Media, to enter, simply visit TV Star Competition 2019 site before Friday 22 February and fill in the short form. Selected entrants will then complete a detailed questionnaire on their business proposition and readiness for TV advertising. Those responses will be assessed and the finalists invited to pitch to a panel of judges in a Dragons’ Den-style event. The judges include industry leaders and directors from All Response Media. Previous winners of the competition include Calm.com, minicabit, Trouva, and LOVESPACE (a double win in 2017). Other notable entrants have been: Adzuna, Beer52, Bloom & Wild, Carspring, and Craft Gin Club. 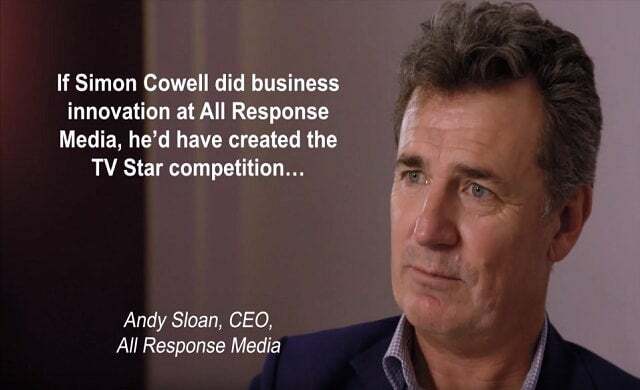 Click on the video below to see Andy Sloan and Colin Gillespie from All Response Media explain more about the competition. Who is All Response Media? All Response Media is a customer acquisition media agency. It uses its proprietary technology, as well as TV advertising experience to help everyone – from start-ups to multinational businesses – build their brands through customer acquisition. As well as the TV advertising campaign worth £50,000, the winner will gain access to All Response Media’s experience and skill in customer acquisition TV advertising to help accelerate growth. Winners will also be able to measure the success of their campaign using All Response media’s ‘TV to web-visits’ attribution measurement and analysis platform, ARMalytics®. Enter All Response Media’s TV Star competition here before Friday 1 March.